They were always on time dropping off and picking up, I felt like my items were secure, and the staff is great! I have used PortaBox for the last 2 years and it has work out very, very well. I would recommend them highly. Great value for the cost! Great customer service!!! We would recommend you to all. Easy to set up, I love that they just bring the storage boxes to you and pick it up- and Jon is very easy to talk to; he makes it an easy and smooth process. Great company. They were easy to work with and schedule pick-ups and deliveries. These guys were great to work with. The one small issue that I had was resolved immediately, and handled very compassionately. The prices were average in the industry, but the people were exceptional. I would definitely recommend! Best Company to work with. Will absolutely use again. Our stuff came back the same way we stored it, nothing broken. Accounting area fantastic to work with also. We stored nearly our entire household with PortaBox Storage for over a year. Jon was easy to work with and our household arrived when scheduled and without damage. There was peace of mind knowing that our goods were secure, in a climate-controlled warehouse and available if we needed access. 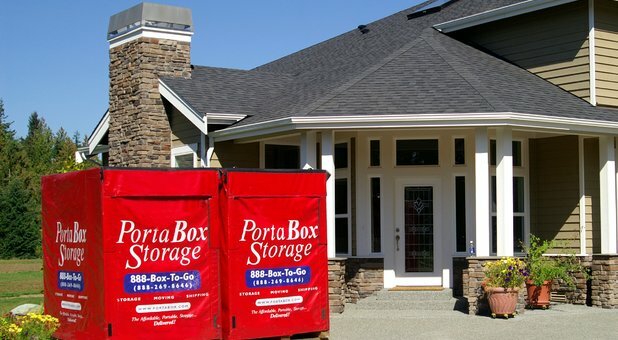 We will definitely continue to recommend PortaBox Storage to anyone who has the need. Porta Box is an Excellent Company, always great to work with. We work with them on every project we have. They were very pleasurable to work with and worked with us in picking up and moving the portable container to a new residence. This company was awesome to work with! Their rep who delivered and picked up the connex was friendly and quite punctual. Everything went smoothly with port a box. The prices beat all the others I found, and all of my stuff was returned in good condition. We couldn't have had a better experience with Porta Box. They always answer their phone, making it easy to ask questions, schedule delivery, and even modify delivery dates and times. They showed up when they said they would, and we found all employees to be friendly and helpful. We emptied our boxes at our new home earlier than expected, and they picked them up the same day with little notice. Thanks for helping to make our move smooth! Would highly recommend to a friend! This was a great experience for us. Working with John at PortaBox was excellent. They showed up exactly when they said,. They had great communication through the whole process. They also were very careful in moving the boxes once they were loaded with our belongings. The entire team was great to work with and will definitely use and refer their services. I sold my home and needed to store all my belongings for about a month while I was in the process of closing on my new house. PortaBox Storage exceeded all expectations during the entire process. They delivered and picked up the storage containers on time as promised at both locations. I even changed my delivery date a day early and they were more than accommodating to help me. NONE of my belongings were damaged and everybody I worked with was nice and professional. I would highly recommend this company for any portable storage needs. I have had to do a lot of moving the past 6 months and the one thing I could count on was PortaBox Storage. Very accommodating, professional, and service was exceptional. Would definitely use them again, highly recommend! Awesome Company with great people!!!! Nothing but positive experience! I had a great experience with PortaBox Storage. The cost quoted to me was less than half of “Pods” and of my more traditional storage unit. The containers arrived on time and were clean, the driver was super helpful and answered all my questions. These guys are great (esp. Jon the manger) and the cost can’t be beat! Rapid delivery of boxes, reasonable cost. Great service. What else is there to say. I have nothing but great things to say about this company. They delivered six boxes that I used to relocate my belongings from Salt Lake to Prove for less than half the cost that was quoted to me by Pods. I will definitely use this company again! I have never been so impressed in my entire life! This storage company offers phenomenal customer service. I needed to store my furniture with very short notice and PortaBox Storage was willing to work with my needs. I made endless calls to other storage companies and PortaBox was the only company that didn't want to charge me extra for how soon I needed store my items. They were able to deliver the container to my apartment, allowed me the time I needed to load the furniture, and returned to pick it up the next day. Not only was I happy with the customer service I received, but the pricing was exceptional as well. I was also able to choose what method I wanted to pay my bill every month. I rest assured knowing that my furniture is stored in a safe place while I am out of the country. I highly recommend PortaBox Storage! Easy to work with, allowed me to have extra containers delivered just in case and didn't charge me for the one I didn't use. Easy, would do business again!!! I saw your red boxes in my neighborhood so I gave you a call to see if you could help with my parents. They’re moving into a retirement village and need to store some of their things. We were able to “thin out” a lot of their treasures while reassuring them that they could always get to them if they wanted. They probably never will, but they feel good about it. Great idea! I shopped around and could not beat the price. But, what really impressed me was the driver's concern and attention for my things - that was the icing on the cake. I'll recommend you to my friends. We moved our furniture from Nevada to Utah about 2 years ago. After dealing with some very challenging and unethical moving and storage companies I was very skeptical with all storage companies. PortaBox was a breath of fresh air. From start to finish everyone I interacted with was extremely professional and courteous. The prices were extremely fair and the service was above and beyond expectations. PortaBox was very flexible and accommodating to my schedule and time frame. I wish other companies operated like this company then the moving experience would be less stressful and would leave people with a better sense of the product they paid for. I have highly recommended PortaBox and will continue to do so. PortaBox Storage is great! They have high-end service here, which is rare for a storage center. The gentleman, Jon, who runs it provides excellent customer service. He is helpful and courteous, and a real class act with good manners. The containers are kept immaculately clean, which is really important for a storage center. This is definitely the best storage center I have ever used. I'm shocked at the good service.